The Greenville Federal Volleyball Invitational will be held this Saturday, Aug. 25. The varsity tournament will be held at Arcanum High School and the junior varsity tournament will be held at Franklin-Monroe High School. Games begin at 9 a.m. at both locations. Admission is $5 and only CCC/GWOC passes will be accepted. Schools in the tournament are Arcanum, Franklin-Monroe, Newton, Mississinawa Valley, Tri-Village, Greenville, Ansonia and Bradford. Greenville Federal, the tournament sponsor, makes a $500 donation to the tournament. 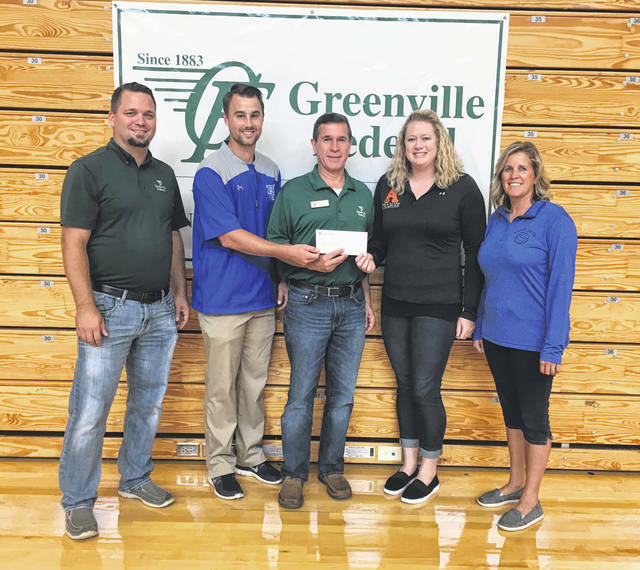 Pictured left to right are Brian Beam (Marketing/IT Manager Greenville Federal), Tyler Rhodus (Franklin Monroe Athletic Director), Jeff Kniese (President, CEO Greenville Federal), Macey Odell (Arcanum Varsity Head Coach) and Angie Filbrun (Franklin-Monroe Varsity Head Coach). This entry was tagged Ansonia, Arcanum, Bradford, CCC, Franklin Monroe, girls volleyball, Greenville, Greenville Federal, GWOC, Mississinawa Valley, Newton, Tri-Village. Bookmark the permalink.